Crumpets go hand in hand with Muppets in my mind. When I was little, the Sunday evenings I remember most fondly used to consist of a bath, then crumpets with butter and honey eaten in the living room (a rare treat!) while watching the Muppet Show on the telly. 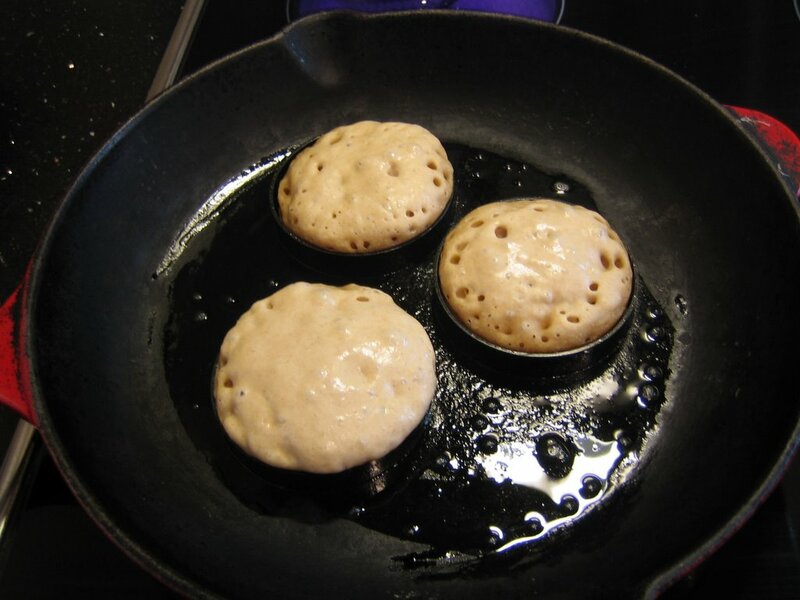 Crumpets are part of a large family of raised breads cooked on the stove top rather than in the oven. English Muffins, pikelets, griddle scones, pancakes are all variations on the theme. Crumpets and English muffins are yeasted, griddle scones, pikelets and pancakes use a chemical leavener. Home made crumpets compare to bought ones, naturally enough, in the same way as home made bread compares to bought bread. They are more tasty, more satisfying, more substantial in some way. One piece of equipment that you do need to make crumpets is a set of metal rings. I use egg rings because I had some, but apparently you can get crumpet rings which seem to be a bit deeper. I cook my crumpets in my cast iron pan, which I really think feels the right pan to use! This dough is simple to mix up and seems to rise so much faster than you expect. This is all good - means we do not have to wait so long for that Sunday morning breakfast. Dissolve the yeast in a cup of warm water. Mix in the flour and the salt. Add more flour or water to produce a thick yet pourable batter. Cover and leave in a warm place until it has doubled in volume, probably about an hour. Heat a heavy bottomed frying pan to medium, add a knob of butter to coat the bottom. Put the rings in the pan, and half fill them with the batter. Leave to cook for about 5 minutes or until the tops are dry. At this point you can either remove the rings and flip them over in the pan, but you will get a more squashed look, or put them in a warm oven to finish. It is quite handy to take the oven route because if you, like me, have only got 3 rings then you will need somewhere to keep the crumpets warm as you cook the rest!